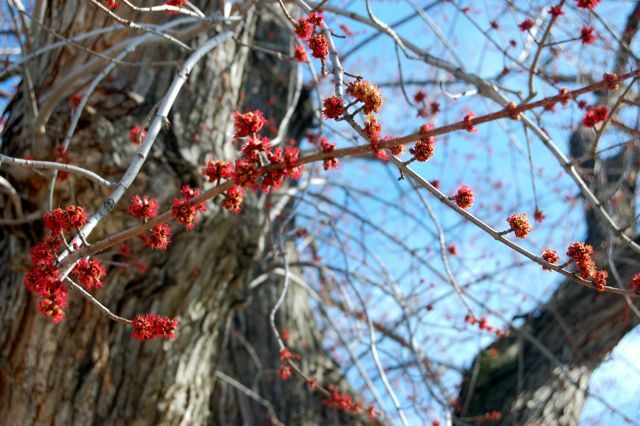 In Toronto, the blooming of the silver maple, Acer saccharinum, is a true sign of spring. Yet most people don’t even notice the modest little pompom flowers because they’re way up there on some of the city’s tallest street trees. When it’s not in leaf, you can recognize the mature silver maple by its shaggy bark. In summer, the maple-shaped leaves are more deeply cut than the more typical (non-native) Norway maple (A. platanoides) that lines our streets in the thousands. Silver maples get their name from the silvery underside on their leaves. They’re fast-growing, which is what makes them so tall compared with their contemporaries. It also makes them rather brittle. That doesn’t stop me from admiring them… in other people’s gardens. In the fall, the leaves of the silver maple turn a somewhat insipid yellow. 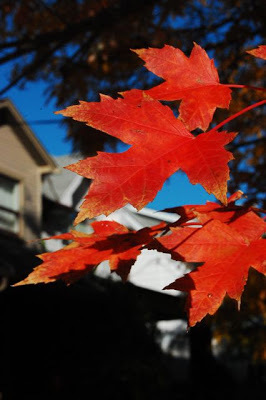 However, in recent years a hybrid cross between the silver and the red maple (A. rubrum) has been developed, giving you a fast-growing tree with a striking red fall colour. These are the Freeman or hybrid maples (A. x. freemanii), and I’ve noticed them popping up along streets (my guess is that this is one pictured at right, taken last autumn) and in newer parks. 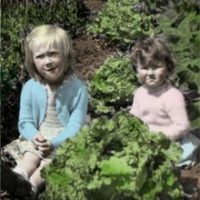 The cultivars have alluring names like ‘Autumn Blaze’ and ‘Scarlet Sentinel’ – and if I’m not wrong, I think Sarah tried one of these out in her country place. Like the bane of my gardening existence, the dreaded Norway maple, both the silver and Freeman maples have the same shallow-rooting tendencies. Given room to grow, however, they’re fine specimen trees, as well as being harbingers of spring. You’re right. I’ve never noticed how red these flowers are. Plus they are downright puffy looking. Almost look fake. I’ll definitely be looking up to see these now. I did plant a silver/red maple cross at the schoolhouse, I think this will be its third year, and it might have named “autumn blaze”. It is now taller than me, starting to look more like a tree and less like a stick. Hope to really see it in its glory one fall.